i normally post a picture every day on instagram because i'm a little obsessed, but my instagram feed was pretty much crickets until Thursday! -my basset loves to snuggle sometimes & she will wrap her arms around my arm - it is so adorable! -Saturday we had a date night for the first time in a few weeks thanks to my crazy work schedule & business trip! -on said date night we went for a walk & i just love that pretty sky! -i discovered a new salad at Panera that i am in love with! it's called chicken cobb with avocado & it is super delicious! with some tweaking it's whole 30 approved too! -for some reason i obsessively take pictures of our food - here is dinner from last night! it's called chicken & veggie crockpot goodness and it's actually a recipe from way back when on Beth's blog that i had saved to my computer & it's one of my favorite dishes! we cook it on Mondays and then i have it for lunch for the week! oh my gosh - that close out sounds like a nightmare! i would have become SO HANGRY if i wasn't able to eat anything ahahha. 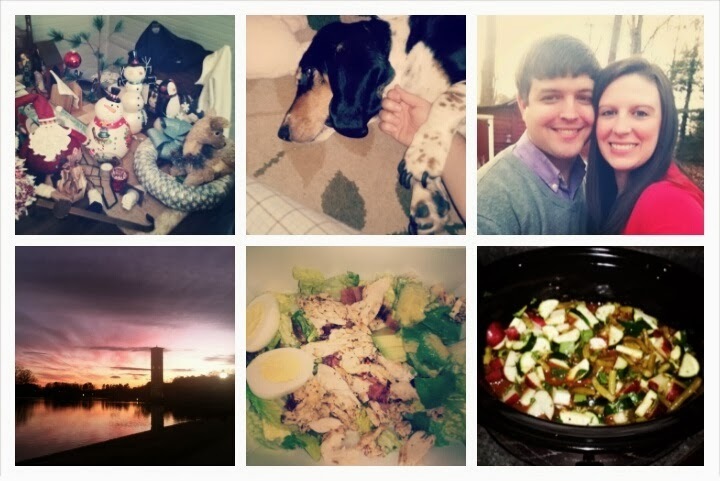 yay for walks, that delicious looking salad, and uh that dinner looks divine! hopeully this week is a slower pace for you! i feel crazy sometimes taking pictures of food & i think i embarrass my husband but it is so fun!! What a crazy work week. What exactly type of accounting do you do? Payroll? I also take pictures of my food ... it's kind of crazy but fun! hahahaha i get hangry too & the struggle is real!! thank you much, friend! i hope you have a great week as well! !